Most of the coverage you might have read or heard about the innovative 'Encounters' exhibition at the National Museum of Australia (NMA – in Canberra) has concentrated on the issue of whether the 152 Indigenous objects borrowed from the British Museum's 2000-strong Australian collection should be retained in Australia by the 27 tribal/language groups who made them between 200 and 100 years ago. For instance, Paul Daley in The Guardian, puts it trenchantly: "The traditional owners of these objects acquired by Europeans in early encounters and now in the British Museum, are certainly denied genuine choice (for now) about where they are best kept", a situation he sees as “part of a colonial continuum”. In other words, the dastardly NMA persists in the sort of History Wars/White Blindfold attitudes that sprouted so embarrassingly in the Howard years when Queenie Mckenzie's painting of the Mistake Creek Massacre was bought and immediately hidden in a basement by the NMA Board of that day. I differ – as does Wiradjuri artist Jonathan Jones, who was quoted in the British Museum version of this show earlier this year saying, “Making these connections begins to undo the acts of colonialism”. I see the fact that today's communities now have a choice about their relationship with these 'disappeared' objects as being the most relevant thing. Without the theft/exchanging/collecting habits of colonials - especially the British Navy of all people - and the enthusiastic museology of the Brits (for all Australia's comparable collection of tribal objects was incinerated with the Garden Palace in Sydney in 1888), none of these magical artefacts would exist today. For nomadic peoples had no interest in conserving objects after their practical or ceremonial purposes had been expended. And most white interlopers had distressingly little interest in taking the objects or their makers seriously enough to record this culture. 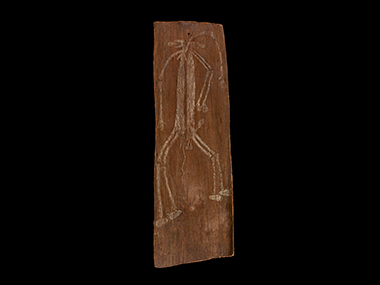 So the connections made today over the 3 year preparatory period for the two exhibitions have generally excited Traditional Owners, many of whom have contributed on a very equal basis to the objects in the NMA's exhibition. I think it's a revolutionary show - who'd have heard of the Star Wars-resonant Dja Dja Warrung clan today without their ancestors' barks??? Exciting though these 1850s Victorian barks (from Fernyhurst Station near Boort) are for the way hey were smoked to allow images to be etched into the surface blackness, and for the pride with which collector John Hunter Kerr displayed them locally and internationally, I was even more engaged by the earliest barks on show at the NMA. These were from the Coburg Peninsular (which I've visited) sticking up from the western end of Arnhemland, and emerged from the unpromising encounter in which colonial authorities, desperate to deny the French or the Dutch access to their new Terra Nullius, built two forts on Coburg – both of which failed through incompetence and disease. But not before the Royal Navy's Haslar Museum had come by an 1830s bark showing two (?) Mimi Spirits entwined, back to back – he suitably erect and she appearing to put an arm around his shoulders. Several thoughts arise. Why have I never come across other barks from Coburg, even in such historic assemblages as the MCA's Arnott Collection? Did the art from there move across to Croker Island in the works of such artists as January Nangunyari? How significant was the Navy's role in Australia's early days in collecting 'native' souvenirs from 18 of the 23 communities that were sited coastally? Were they taken in an imperially triumphalist manner, or simply out of curiosity – as evidence of the different skills of this unknown world? Certainly Muran woman, Carol Christophersen from Coburg today sees them as “reminding us of how much we still know, of how much we retain – how proud we are”. 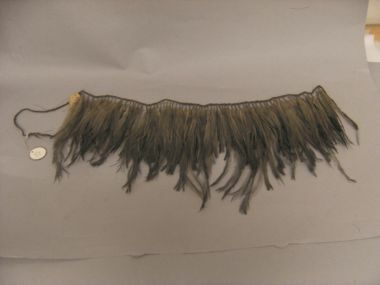 But then there's the Gunditjmara debate from Warnambool in which elder Denise Lovett regrets “It's sad that we don't have the whole meaning of them, that they're just objects...the next generation needs to sing and dance with the object”; while Wendy Berrick, shown making a feather skirt like its 1840s ancestor on show today, insists, “Our history is not disconnected from people today. We're right here”. And finally, there's the ubiquity of bark as the canvas for significant expression right across this supposedly Terra Nullius. Another series of thoughts emerge at the very beginning of 'Encounters'. After a rather tokenistic passage through Canberra's Ngunnawal (or should that be Ngunawal or Ngambri – all three names are represented?) Country, we're greeted by three sets of spears – the Gweagal fishing spears that Cook and Banks collected in Botany Bay, Yolngu spears found in Makasser and originally assumed to be Indonesian, and the brutally serrated spearhead removed from one of Phillip Parker King's sailor's shoulders when a friendly exchange at Hanover Bay in the Worroorra's Kimberley Country turned nasty in 1821. Is this intended to suggest a widespread level of hostility to the invaders right across this theoretically empty Continent? For the much-pictured Gweagal shield that Cook brought home after a shot had (probably) penetrated it in 1770, causing its holder to dump it and run, is certainly evidence of hostility. Even more so the magnificent, so-called Davidson Shield from Rainforest Queensland – a sensational design with signs of bloodstain. A Jirrbal elder today recognises a Gulnay Shield. And Djiru man Leonard Andy declares, “You'd never give away your shield or sword, they'd have to kill you to get it”. John Davidson almost certainly did kill the shield-holder – he was a pretty disappointed man, failing to establish a sugar plantation in the 1860s and coming up against aggrieved locals wielding mighty one and a half metre long wooden swords and metre high shields. Not far inland from Davidson's Rockingham Bay was the much happier cattle property called Lammermoor. While the British Museum iteration of this exhibition proudly showed off the stately home in Britain filled with Aboriginalia when the Christison family returned 'home', the NMA had much more interesting, usually identified photographs of the Dalleburra families with whom the Christisons clearly empathised – accompanied by the amazing 1863 Land Rights statement by Robert Christison to the elder, Ko-Bro: “Country belonging to you; sheep belonging to me”! The two parties even communicated via traditional message sticks – a fine example, in curator Ian Coates's words, of not “separating the tangible from the intangible”. Sadly, the Queensland government failed to maintain these levels of mutuality – the Dalleburra were shipped off to Palm Island and Baramba Mission pretty soon after the Christisons left. Talking of Ian Coates, he and his team did more than 200 interviews with descendants of the people who'd made the historic objects on show – often recording their continued manufacture and use of such artefacts. “We really wanted viewers to know the strong contemporary feelings about this material. I did a Cook show here once – and I realise now it was just objects....19th Century museology. And our catalogue is less the dominating white curatorial voice, more extended contemporary quotes about both the objects and the history”. I recently read a second-hand bookshop's catalogue referring uncritically to a book about the “extinction of the Tasmanian aboriginal race”! Its author should go and see the delightful John Skinner Prout portraits of some of the 134 deported Tassie Aborigines, drawn in their exile at Wybalenna on the Bass Strait Flinders Island. They look so sad – but strong and surrounded by their children; and their descendants today, even while reporting that “they were so homesick they used to climb to the top of the hill and think they could sort of fly off”, insist, “they made sure information was passed down through their families...against all odds”. These portraits – along with so much else – made it into the British Museum collection through the hands of Augustus Wollaston Franks, Keeper of Ethnography at the BM in the late 19th Century, who bought much Australian material from its original collectors' estates, and then donated it to his employer. Another donor, who clearly meant little to the BM folk, was one Tom Roberts, painter – ironically the current subject of a huge retrospective at the nearby National Gallery. 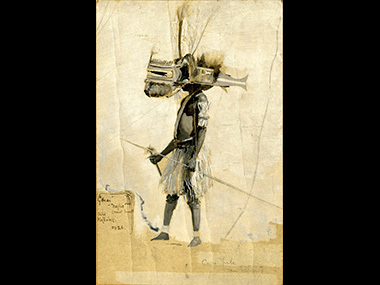 His work in the Torres Strait in 1892 was unrecognised in London until researchers for 'Encounters' hit upon it – a series of individual images of masked TSI dancers and a vivid painting of a ceremony at night on Mer. The NGA has had to use a photo of this! But at the NMA, a passing Torresian informed me that the individual dancers are wearing Western TSI head-dresses, but the same masks turn up in the Mer ceremony – a far eastern island with a different iconography. Our Tom was cheating! But still engaging the locals 120 years later! In fact, Roberts painted the individual dancers at the nostalgically-named Somerset, another northern failure by colonial authorities, who thought this brief Cape York settlement could administer the Strait islands. This is Aboriginal Gudang Country – and the most delightful contemporary artwork in 'Encounters' is Colina Wymarra's painting of a Gudang woman covering her nakedness in the Union Jack that Capt Cook had vainly planted on Possession Island to claim 'New Wales' (sic) for Empire. According to local legend, she had seen this strange 'cloth on a stick' as a valuable blanket. As writer Alex Matchett noted of the British Museum show (which didn't include this painting): “One can almost see the chasms of ignorance yawning from Cook's flagpole”. Talking of ignorance, one would wish all those involved in Canberra now considering a constitutional future for Indigenous Australians to head across the water to the National Museum. For as Coburg man Don Christophersen wisely appreciates: “The Indigenous and non-Indigenous versions of history are both telling the truth – but not telling the same story”.